Port Jefferson Station, NY - July 25, 2018 - Suffolk County Executive Steve Bellone and the Stephen Siller Tunnel to Towers Foundation today announced a gift satisfying the mortgage for the family of Staff Sgt. Dashan Briggs, a Port Jefferson Station resident who perished in a helicopter crash in Western Iraq. Rebecca Briggs, the widow of Technical Sgt. Briggs, anticipated a check for $33,000 towards the payment of her existing mortgage at an event in Hauppauge. 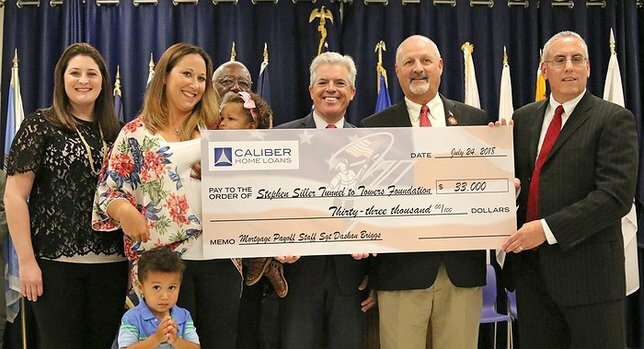 While the original gift of $33,000 was provided by Caliber Home Loans, she was surprised to learn that it was actually the final contribution necessary for the Tunnel to Towers Foundation to satisfy the family’s mortgage in its entirety. Frank Siller, CEO of the Stephen Siller Tunnel to Towers Foundation was in attendance to presented the Briggs’ family with the check for the remainder of the mortgage on their Port Jefferson Station home. The County Executive issued a proclamation recognizing the generous work of the Foundation in helping catastrophically-injured veterans in Suffolk County. He also announced he will run in the 2018 Tunnel to Towers 5K Run and Walk on September 30 in Red Hook, Brooklyn. Technical Sgt. Briggs, 30, is survived by his wife Rebecca and two young children, Jayden and Ava. A 2007 graduate of Riverhead High School, where he was a standout football player and member of the lacrosse team, Technical Sgt. Briggs was a full-time member of the Air National Guard 106th Rescue Wing in Westhampton Beach. Briggs was among seven military personnel who perished in the crash of the HH-60 Pave Hawk helicopter in western Iraq near the Syrian border. He and three others aboard the aircraft — Capt. Andreas B. O’Keeffe, 37, of Center Moriches, Capt. Christopher T. Zanetis, 37, of Long Island City and Master Sgt. Christopher J. Raguso, 39, of Commack were members of the 106th Air National Guard Rescue Wing. The mission of the Stephen Siller Tunnel to Towers Foundation is to honor the sacrifice of firefighter Stephen Siller who laid down his life to save others on September 11, 2001. The Foundation also honors our military and first responders who continue to make the supreme sacrifice of life and limb for our country. Subject: LongIsland.com - Your Name sent you Article details of "Suffolk Executive Bellone, Stephen Siller Tunnel To Towers Foundation Announce Mortgage Paid For Family Of Technical Sgt. Dashan Briggs"